Located right on the beach with uninterupted idyllic sea views. You can hear, see and smell the beach literally from every room in the house. The Copthorne hotel is less than 400 meters away for those attending an event, or if you are after a great bar or restaurant to socialise in, or perhaps wander down for a coffee by the pool. Kiwiana holiday at its best. Perfect, safe n sandy beach where you can swim in all tides. Access to the beach is a 20 meter stroll over the dunes. Sleep soundly with the sounds of the ocean lapping close by. There are two kayaks available to use. One single and one double, with lots of places to explore. Kids can kayak in the stream which is teaming with small fish and kora. You can choose to swim in fresh water or the ocean. The choice is yours. Brand new comfortable beds with new duvets and pillows. Two queen beds and a king bed, which can be split into two single beds if needed. The house had just been completely renovated and is modern and stylish to make your stay something to remember. This property is not an old tired run down property, it's been designed with full comfort in mind with ceiling fans and open plan kitchen and amazing indoor outdoor flow. On a good day you can look out from the deck and will see Orca, Dolpins and seals playing in the bay with the stunning sand dunes in the background. Also close to cafes, supermarket, boat ramp and hospital 25 mins away in Rawene. For those with a boat. Plenty of safe parking space for a boat with hoses for cleaning, along with a fish cleaning station, for all those monsters you will catch. We make check in and out easy for our guests with a keyless entry system. We will give you a code prior to your trip. We also have a property manager close by to assist you with any needs you may have. Internet wise we can supply you with unlimited VSDL fast connection - fast enough to video conference or stream Netflix. Well stocked 4 square supermarket close by for all of your food and beverage needs. Make sure you check out the local cafes with some of the most amazing meals to choose from. Lisa and Shayne have a hectic lifestyle where we interact with groups of people every day in our busy careers. Whilst we love this lifestyle, we also need to balance ourselves with a place we can go thats peaceful, tranquil and transports you to another world. Open the front doors, walk across the section and straight into the water, you cant ask for better than that. If you want a true Kiwi Bach Experience - then this is it. Simple, unspoiled with all the comforts of home. Fishing, swimming kayaking, scallops, marine life right here. The property has had a complete renovation (October) and is ready to welcome you now. Spectacular views of beach, sand dunes and orca and dolphins (on a good day) Copthorne Hotel a short stroll for entertaining. You will not be disappointed !! Full cotton sheets, super comfortable beds with gel infused pillows with ceiling fans to keep you cool. Returned to a place I had been 50yrs ago and the view from Steve's place brought back childhood memories. The house was great, it fulfilled all our needs and was very secure. We would highly recommend Steve and his place to future Omapere visitors. Thanks for staying with us. Shayne is my name by the way lol. Fabulous beachfront property - sitting on the deck looking at the view across the harbour to the sand hills is as good as it gets. We would have loved to have had a longer stay. The place was well laid-out for two couples. The things that we thought could be improved were the lack of solid curtains in the smaller bedroom (sleep masks were needed) and the inability to close the door of the larger bedroom (seemed to be warped as it caught at the top if you tried to shut it). Otherwise, a most enjoyable stay. 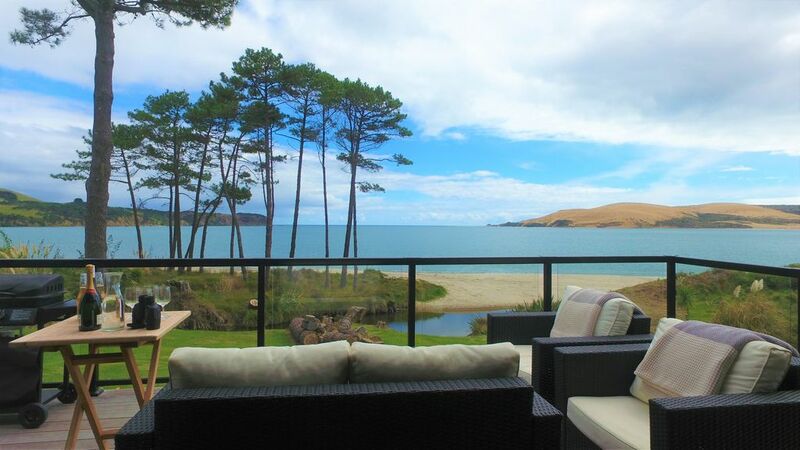 Great location , warm and quiet house with stunning views across the harbour out to the sand dunes. Quick and easy communication with shayne made this trip hassle free. Great location..comfortable...great instructions and communication with the owner. The location was ideal. It is a short walk away form the jetty, a local cafe and the Copthorne Hotel. The view is spectacular and you have close beach access for swimming and walking. The bach has lots of room and a nice deck space out back. This place has lots of potential and many visitors are sure to enjoy it in the future. Make sure you visit the spectacular Kauri Forrests featuring the largest Kauri tree in the world - Tane Mahuta. Just a quick 20 miinute drive. Fishing is spectacular in this part of the world for Kingfish Snapper and Flounder.